I don’t hate Gwent. The original minigame in The Witcher 3 was more than decent enough by minigame standards — horribly unbalanced, obviously, but it had had far more effort put into it than, say, Caravan from Fallout New Vegas. There was definitely an interesting concept there that could have been expanded into a proper full-on game, and this CD Projekt duly did with their Gwent1 multiplayer spinoff. Gwent is a free-to-play product that’s supposed to be challenging for the Hearthstone market. I played a few hours’ worth of it, which was enough to convince me that it wasn’t going to be a serious challenger to Hearthstone; it was considerably more complicated than the minigame, when the appeal of Hearthstone (at least before it got smothered underneath the weight of its own expansion packs) was that the core mechanics were very easy to understand. I didn’t think much of Gwent as a long-term prospect. But I didn’t hate it. I’m saying this to establish my biases. When I say “The Thronebreaker single-player campaign for Gwent would be a far better game if you removed Gwent from it.” it is not because I hate Gwent. I like Gwent, for all that I didn’t invest much time into the multiplayer side of it. 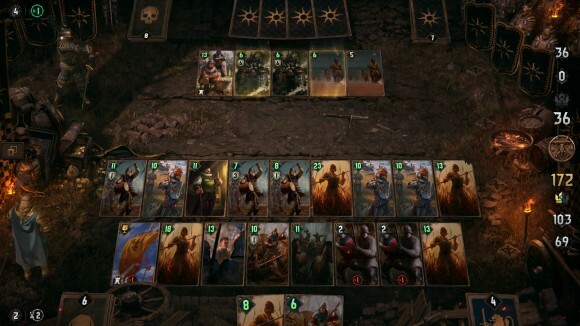 The problem is that Thronebreaker accompanies a big overhaul of the ruleset that moves it much closer to Hearthstone without necessarily removing all that much of the complexity, and I get the distinct impression that CD Projekt were afraid of overtuning the difficulty of their single-player encounters at the same time as introducing all of these changes to the way Gwent plays. It’s a reasonable fear to have; you can’t assume expert-level knowledge on behalf of your players at any time, and especially not when you’ve just upended the rules of the game. However, Thronebreaker overcompensates by playing it way too safe when it comes to encounter difficulty. Nearly every single non-puzzle encounter in the game can be beaten with the same deck, and the same strategy. Note that this is not a simple problem of there being one particular deck build that’s overpowered; rather, that any deck you put together that has a reasonable amount of synergy between the cards will be able to faceroll 99% of the battles in the game. 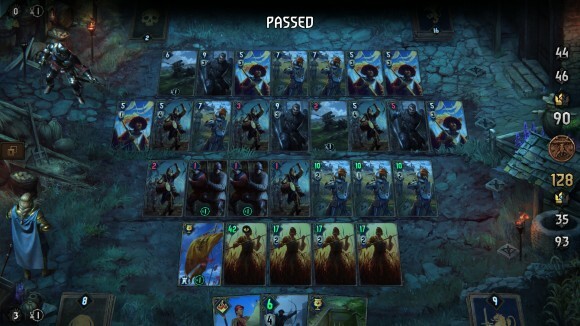 Thronebreaker’s version of Gwent is still ostensibly about playing a series of cards whose sum value is greater than that of your opponent, and about doing things to manipulate those card values up and down. The thing is, while previously Gwent had a decent balance between building you own card tableau up and manipulating or destroying your opponent’s cards to reduce theirs, this new Gwent appears to be solely about kicking your opponent in the nuts as hard as possible at every opportunity. You still win rounds by having the highest card value, but it’s easy to have the highest card value when you’ve blown up every single card that your opponent has played. Every single card now has some ability, either when played from hand or activated later via Order charges that can be built up over time, and most of these abilities revolve around damaging the other player’s cards. You now have a hero with an ability that can be activated every few turns that either boosts one of your cards or damages your opponent’s, and using this ability also activates any card abilities that have the Loyal keyword; this, again, usually results in more damage dished out to your opponent’s side of the board. When you have hero abilities and a bunch of cards that can repeatedly attack your opponent’s cards and most of the battles in the game now only take place over a single round and you’ve also incidentally hugely simplified the card row system (there are now only two of them, and all cards may be played onto either row and work the same way no matter which row they’re on) it’s easy to see how Thronebreaker Gwent now very much resembles Hearthstone — and in fact there’s a puzzle in the game that directly parodies it, and the only special mechanic it needs in order to do so is Hearthstone’s mana system. The Gwent portion of Thronebreaker consequently becomes rather boring. About a third of the encounters in the game are the special Puzzle encounters, which hand you a limited set of often very custom one-off cards and a specific problem to solve, and it’s about crunching the numbers and playing the cards in the correct order and position to win. Some of these are lighter references to other games (there’s the aforementioned Hearthstone parody, a Bejeweled scenario, pick-a-pair etc.) and don’t require much brainpower to figure out, but the rest are pleasingly taxing — if a little too prone to trial and error to figure out what exactly the scenario parameters are, because they’re often too complex to be encapsulated in the scenario card descriptions. The Puzzles are fine, mostly, and I got quite excited whenever I saw one because I knew it’d be more interesting than the standard encounters, but there’s too few of them to really spice things up enough that I was properly happy with having to play Gwent again and again in order to get to the properly good part of Thronebreaker: the story. Now, I don’t want to build it up too much, so I’ll say right now that Thronebreaker’s story isn’t exactly Witcher 3 tier. It follows the Lyrian Queen Meve as she attempts to beat back the Nilfgaardian invasion of her country (along with the rest of the North); despite having a ton of named characters and morally grey choices this story is solid and workmanlike and doesn’t really have any ambition to be more than this, but I think that’s okay for something that’s supposedly only there to provide context for the card games, especially since I think most other studios would have simply phoned it in. What did impress me about it is how it captured the broad political sweep of the war that’s raging in the background of the main Witcher series and brought it to the fore; you see snippets of it when you’re playing as Geralt, and you’re surrounded by the obvious signs of conflict in Witcher 3, but you never really have the information or the context to properly join up what you see from your position on the ground. 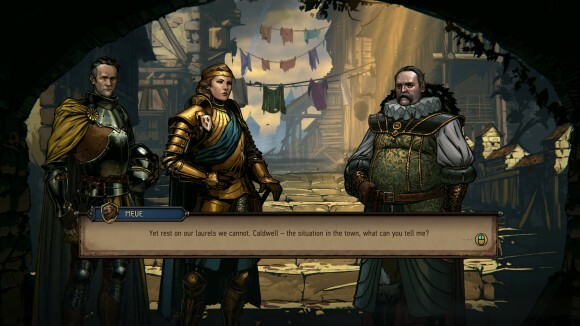 Thronebreaker gives you this context, and together with the various internal ructions within your camp — your advisors vehemently disagreeing on which course of action to take, the Nilfgaardians being sneaky fucks who take every opportunity to infiltrate your retinue etc. etc. — it paints a surprisingly comprehensive picture of a region at war, complete with the personal human costs of it. Tossing in the moral choices meant it felt a lot like a good Telltale adventure, except unlike your typical non-Borderlands Telltale game this one actually had a payoff since the game does keep track of your actions and isn’t shy about confronting you with the consequences. 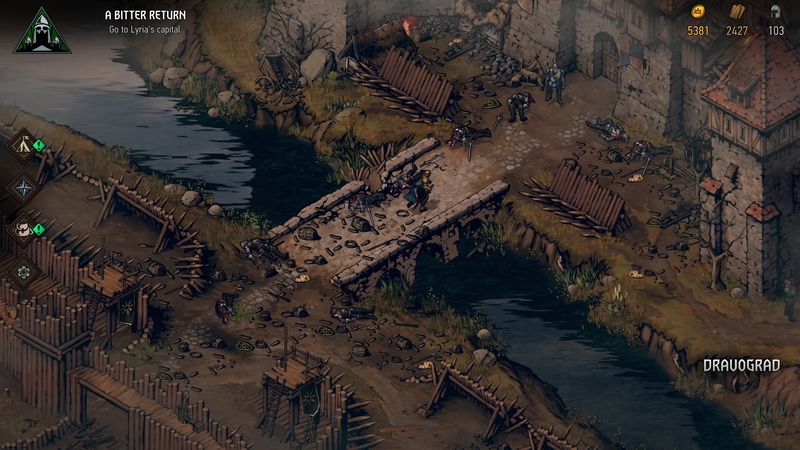 Aside from those choices the actual RPG side of Thronebreaker is very light. You wander very slowly around a set of nice-looking 2D environments, knocking off encounters, completing the odd quest (which are almost all “Go here and kill a thing via card combat”) and hoovering up resources. You use these resources to upgrade your army camp, which unlocks new cards and upgrades existing ones; you can also do things like up the manpower limit that lets you include more cards in your deck, but I don’t know why you’d ever bother with this when the entire point of a deck-builder is that you keep things relatively lean and include as much card draw as possible so that you’re guaranteed to be able to get what you want when you need it. I did like how the process of building the camp felt like building up an army, as you start with a bunch of peasant cards and end with Landsknecht, but there’s little opportunity to acquire cards outside of what the army camp offers. You get a ton of artifact cards thrown at you via the puzzles, but you can only have one of these in your deck at a time. Characters join your retinue (and also leave it, depending on decisions you’ve made) and are represented by their own cards that you can play in combat, and they can also be upgraded to stronger versions if you make the “correct” choices in your interactions with them, but the synergy between character cards is limited and you’ll not want to play more than a few of them in a deck at once. Aside from that the army camp is all there is, and the upgrades are a little bit of a false choice anyway as you get so many resources that you’ll be able to fully upgrade everything by the time you get halfway through the game. I cannot help but be disappointed in Thronebreaker, then. I was expecting a series of Gwent challenges tuned along the lines of what you can find in the various Hearthstone Adventure packs, where you have to customise a deck to an encounter and iterate its composition over several attempts until you find the one that’ll crack it. A chess problem equivalent of Gwent, basically, whereas what I got was the Cookie Clicker version, where each combat was the same rote steps of clicking on things until I won. Rarely did I have to think about what I was doing; I didn’t often think about which cards I should be mulliganing for (always go for the Drummers) and I didn’t have to think about how to sequence my card plays or where to use their abilities. Outside of the puzzles the answer was almost always obvious, and even though it’s still possible to make some quite considerable misplays (and I did, mostly because I was barely paying attention) the encounter difficulty is so easy that this just didn’t matter. 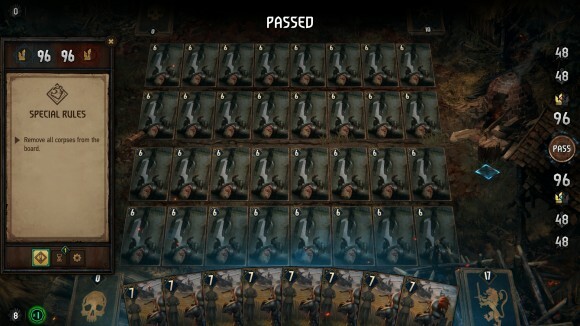 Now, I will admit that I was playing on Normal, and that there is a Hard difficulty setting, and maybe this provides the challenge I’m looking for — but then we come up against the second problem that Thronebreaker has, which is that I just don’t think much of its new remixed version of Gwent. It’s lost a great deal of what differentiated it from its competition, and because of the way Thronebreaker is structured I would have to play through a significant chunk of dead-easy content again, even on Hard, before I would be able to see if later encounters were any better. I don’t want to do this, even though I am moderately interested in trying the story a second time to check out some of the other branching paths. I don’t think putting up with the incessant card combats is worth it just for that. Thronebreaker is a game that might interest fans of the Witcher universe for a once-through of the story — although even they will likely end up gritting their teeth in the latter half of the game as they run across yet another braindead combat encounter — but if you’re interested in it for the CCG component I’d have to advise you to steer well clear because it’s just not good enough to sustain 22 hours of gameplay.